When you are visiting our ShowRoom by train, please use the provided route planning tools. The stop, only 1 stop from the central station, is called Nuremberg-Steinbühl. 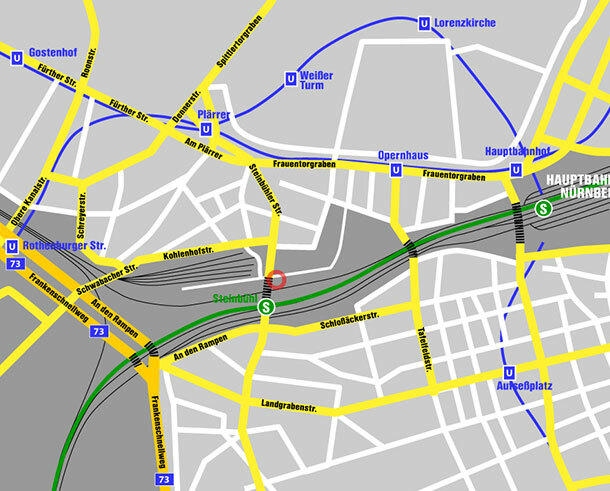 For best results by car, though, put Zufuhrstrasse in your navi and cross Kohlenhofstrasse, it takes you right onto the Kohlenhof industrial zone. Follow the road for approx. 250 m, then turn left and you'll see Gate (Tor) 16 - 18 in front of you.